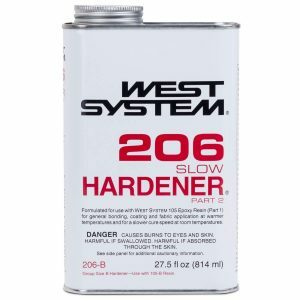 WEST SYSTEM 105 Epoxy Resin and Hardeners make up a versatile epoxy system that can be used for everything from basic, long-lasting repairs to the construction of high-performance composites. 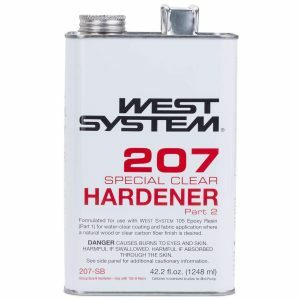 When blended at the appropriate mix ratio, WEST SYSTEM Epoxy Resin and Hardeners will cure to a high-strength plastic solid at 72°F. The resulting plastic adheres tenaciously to a wide range of materials including woods, fiberglass and other reinforcing materials, and metals. Select from a range of hardeners and additives to tailor your epoxy mixture’s handling characteristics and cured physical properties to suit your working conditions and specific coating or bonding application. 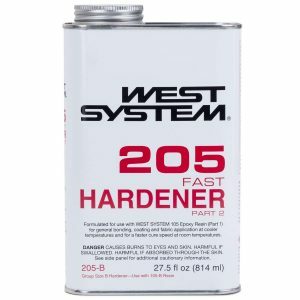 WEST SYSTEM Epoxy resin and hardeners are packaged in three “Group Sizes.” For each container size of resin, there is a corresponding sized container of hardener. When purchasing epoxy resin and hardeners, be sure both containers are labeled with the same group size letter: A, B, C, or E.
Store epoxy resin and hardeners at room temperature. Keep containers closed to prevent contamination. With proper storage, epoxy resin and hardeners should remain usable for many years. After a long period of storage, verify the metering accuracy of your epoxy pumps. Mix a small batch of epoxy (3 pumps strokes of resin and 3 pump strokes of hardener), stir thoroughly for one full minute and leave in the mixing cup. 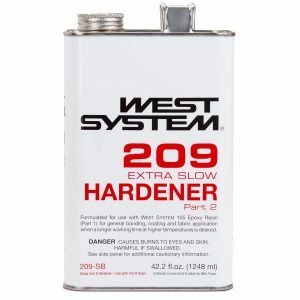 The epoxy should cure to a solid within the time frame listed on the hardener can for the temperature of your working environment. This lets you know that your epoxy resin and hardener has not become contaminated and should be suitable for use on your project. Over time, 105 Epoxy Resin will thicken slightly so will require extra care when mixing. Repeated freeze/thaw cycles during storage may cause crystallization of 105 Resin. If this occurs, simply warm the resin can to 125°F and stir to dissolve the crystals. Hardeners may darken with age, but cured physical properties are not affected by color. If clear finishing, be aware of a possible color shift if you plan to use very old and new hardeners on the same project.